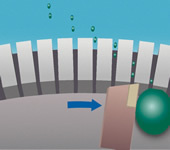 When a material is fed via a hopper, it is cut (triturated) by means of a compound force comprising impact, shearing, compression, friction and so on ; this force is generated by a rotor and many blades edges which are planted in a ring(=blade ring) placed around the rotor. 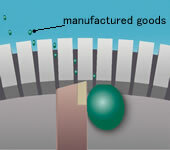 Ground material is pushed outside of the grinding area through the minute openings between each two blades. The rotor and the blades are very precisely machined so that the clearance between them keeps 300μm, which ensures consistent particle size of product. The blade ring is available with every 20 pieces of blades planted therein. Minimum number of blades is 50 and maximum is 222.Select a certain blade ring which most suits your requirement: primary cutting, fine cutting, or ultra-fine cutting. 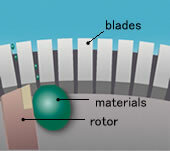 The blade and the tip parts of the rotor are made of super-hard special steel. The first ultra high-speed grinding machine in the world - this machine gives a solution to capacity shortage of traditional stone mills. On top of it, you would find in this machine a potentiality that might surmount a established theory in grinding. Try and see solutions gained by our stone mill which we recommend with confidence. The ultra precision machining keep the clearance the rotor and the blade at 300 microns is performed. The blade ring is available for every 20 pieces of blades planted therein between 50 to 222 pcs. A cutting head or a grinder can be mounted subject to applications.